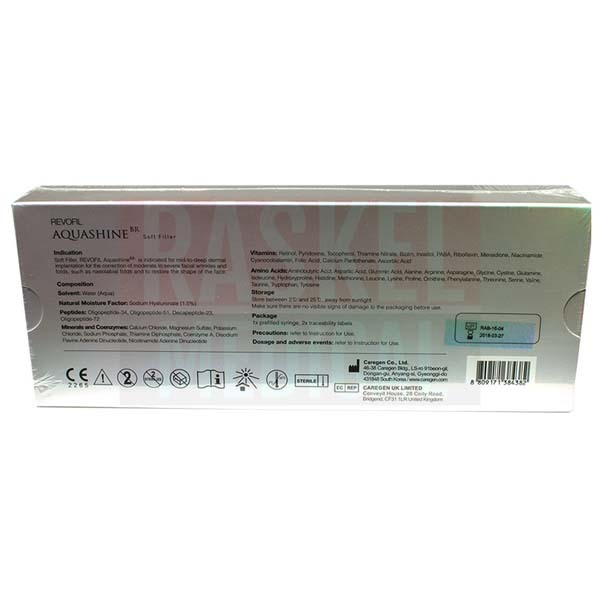 Revofil Aquashine BR Soft Filler is a cross-linked hyaluronic acid filler in a sterile and transparent gel form. It is mainly used to correct wrinkles and prevent hyperpigmentation. Additional benefits include, but are not limited to, boosting hydration, tightening pores, and improving skin elasticity. The main ingredient of Revofil Aquashine BR Soft Filler is hyaluronic acid, a naturally hydrating substance. When injected into the body, it instantly binds to up to 1,000 times its molecular weight in water, plumping and moisturizing the cells. This formula also has the addition of patented biomimetic peptides, allowing the hyaluronic acid to better resist degradation within the body. With this, its effects are able to last longer. This formula also contains amino acids, vitamins, and minerals, which work together to increase cell turnover, nourish skin, and improve elasticity. In vitro studies of the dermal/epidermal cohesive effect of Revofil Aquashine BR showed a 75% increase in collagen and a 48% increase in hyaluronic acid. Additionally, the inhibiting activity of hyaluronidase (an enzyme which breaks down hyaluronic acid) decreased by 91%, while protection from oxidative stress and cell damage also increased by 60%. This formula is manufactured by Caregen Co., Ltd. This product originates from Gyeonggi-do, South Korea. The common side effects associated with this filler are often mild and usually resolve within 1 week. Refer to the product leaflet for a complete list of adverse effects. Revofil Aquashine BR Soft Filler has been proven safe and effective in treating different skin types, including dry to oily, normal, and acne-prone skin. It is also beneficial for treating skin imperfections such as sunspots, freckles, hyperpigmentation, and dull and dehydrated skin. Take a complete medical history of the patient prior to injection. Avoid using this filler on patients with a known history of severe allergic reactions, who have active skin infections, or who are immunocompromised. These injections should not be given to patients under the age of 18, as well as pregnant and breastfeeding women. Caregen Co., Ltd, the company that manufactures Revofil Aquashine BR, acquired 21 PCPC patents for growth factors and 98 patents for biomimetic peptides. It was also awarded more than a hundred patented materials in Korea, USA, and Europe. Its manufacturing and distribution of dermal fillers is CE certified in conformity with ISO 9001, 14001. 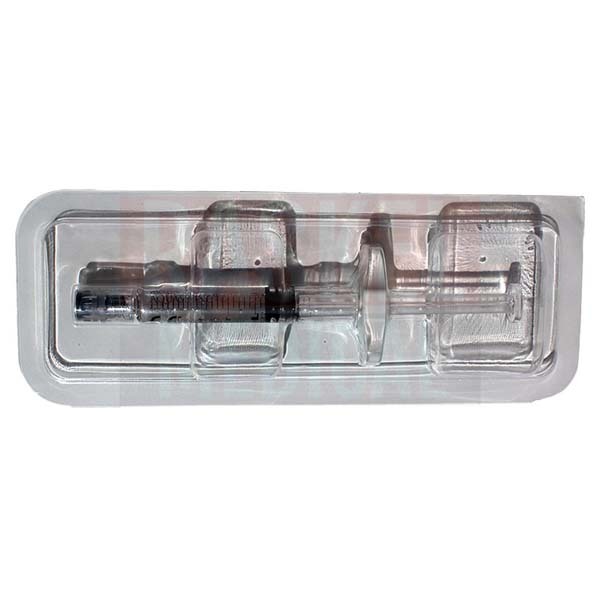 Revofil Aquashine BR is a transparent injectable gel that comes in a sterile pre-filled syringe. Check the contents of each package prior to injection. Do not use if the packaging appears tampered or damaged. The provided traceability labels must be attached to the patient’s medical record. 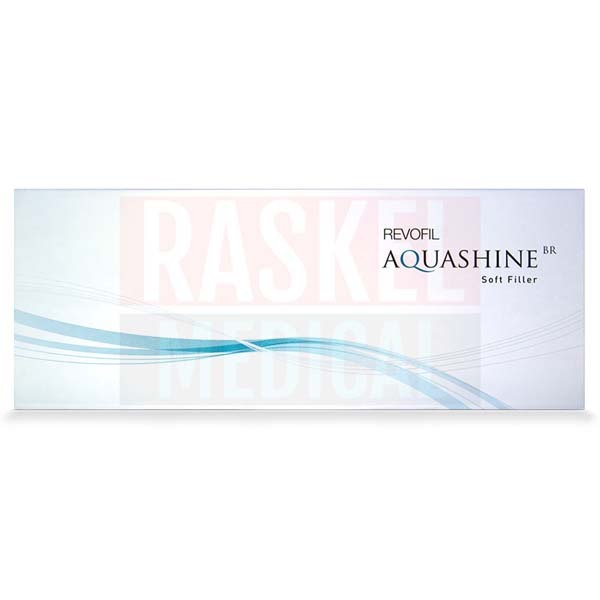 Revofil Aquashine BR is intended to be injected into the mid to deep dermis of the face, neck, and decolletage. Disinfect the treatment area following proper aseptic techniques. The use of topical or local anesthetic is recommended for patients with low pain tolerance. Slowly inject the contents of the syringe at a 30-degree angle from the targeted skin wrinkle. Avoid overcorrection. Gently massage the treated area to distribute the gel evenly. For maximum efficacy, at least 3 injections at 4-week intervals are recommended. 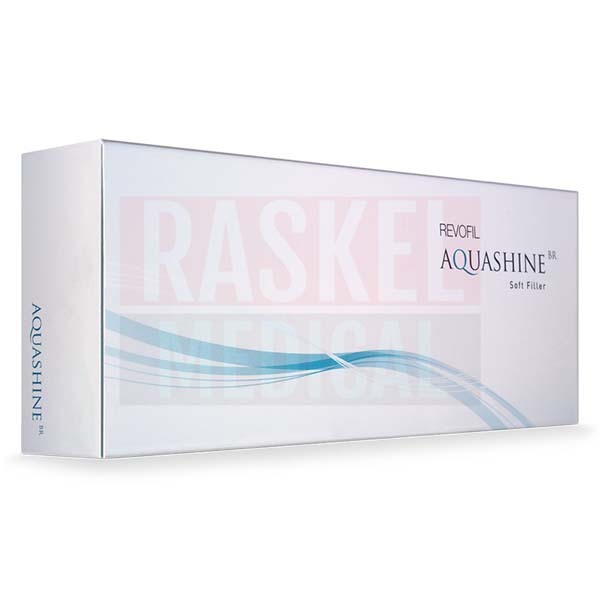 Revofil Aquashine BR contains 15mg/ml of non-crosslinked hyaluronic acid. It also contains a long list of multivitamins, minerals, and amino acids. 1. Vitamins – retinol, pyridoxine, tocopherol, PABA, riboflavin, menadione, niacinamide, cyanocobalamin, thiamine nitrate, biotin, inositol, folic acid, calcium pantothenate, and ascorbic acid. 2. Minerals and coenzymes – calcium chloride, magnesium sulfate, potassium chloride, sodium phosphate, thiamine diphosphate, coenzyme A, disodium flavin adenine dinucleotide, and nicotinamide adenine dinucleotide. 3. Peptides – oligopeptide-34, oligopeptide-51, decapeptide-23, and oligopeptide-72. 4. Amino acids - aminobutyric acid, aspartic acid, glutamic acid, alanine, arginine, asparagine, glycine, cystine, glutamine, isoleucine, hydroxyproline, histidine, methionine, leucine, lysine, proline, ornithine, phenylalanine, threonine, serine, valine, taurine, tryptophan, and tyrosine. This formula’s unique combination of cross-linked hyaluronic acid and biomimetic peptide provides long lasting and natural-looking results. The full effect of Revofil Aquashine BR may last up to 6 months. The duration of the results can be affected by the patient’s age and metabolism. Revofil Aquashine BR contains ingredients that are sensitive to air and extreme heat. Store at a temperature not exceeding 25℃ and not lower than 2℃. Refrigeration is not required. When stored unopened and in its original packaging, this product remains viable for up to 2 years. Do not use past the expiration date marked on the package.